Since 1983, providing vigorous representation to individuals and privately owned businesses. In 1983, our firm was established with the goal of providing the best in vigorous and conscientious representation of clients. This goal has been attained, with special emphasis of "hands-on" attention to detail and to the particular needs of each client. This standard of legal service is consistently maintained, whether the setting is heated adversarial litigation, a high pressure business, estate, or real estate transaction, or simply a routine legal matter. Qualified support personnel are utilized to assist in providing each client with the attentive service and personal attention that each client deserves. The range of legal services provided includes most issues of civil law, including corporate, probate and estate (wills and successions), real estate, commercial, construction, personal injury, and insurance claims and litigation, as well as divorce, custody, marital property, and related issues. 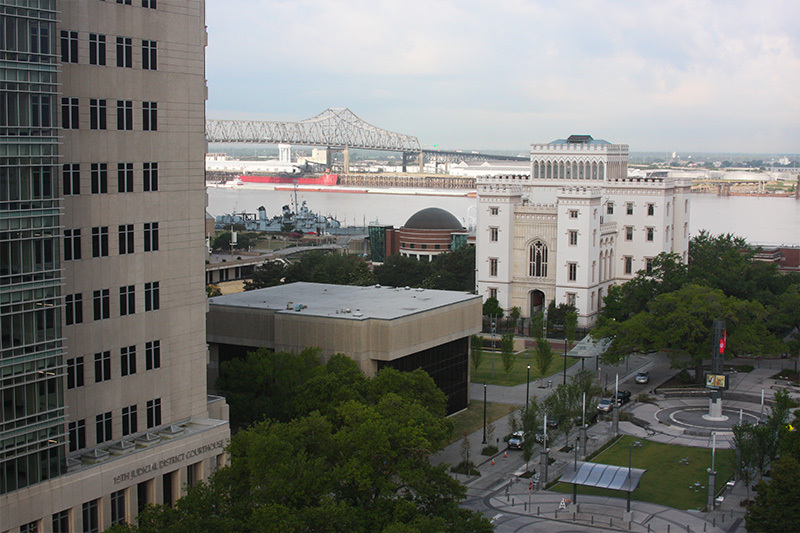 In February, 2010, in order to better serve our clients, we relocated our office to the City Plaza Office Building in downtown Baton Rouge, 445 North Boulevard, Suite 310, across from the new State of Louisiana, 19th Judicial District Courthouse. This has proven to be a tremendous asset in many ways (including across-the-street convenience to the new Courthouse, plus an incredible view of the Mississippi River). Our office has its own parking garage for the convenience of our clients. We look forward to serving your legal needs from this unique location, depicted by the photograph above of the view from our office.